As Microsoft readies the debut of Windows 8 beta code for February it's sharing more about one of the biggest additions to the upcoming operating system, a brand new app store. Microsoft is calling it Windows Store and it will feature what are called Metro-style apps designed for both Windows 8 tablets, laptops, and desktop PCs. Metro-style apps are primarily for managing photos, entertainment, social networking, and messaging on Windows 8 devices. The Windows Store, Microsoft said Tuesday, will be the only way for consumers to purchase and install Windows 8 Metro-style apps. In other words, Microsoft will have complete control over what you can put on your PC when using apps in the new touch-friendly Metro interface. This is a dramatic departure from Microsoft's previously more open philosophy that let anyone download to their PC any software they wanted from any source they wanted. Microsoft is making this change to ensure Metro-style apps are better protected from malware, bugs and other typical PC problems. The end result, however, is that you must rely on Microsoft's judgment about which apps are and are not appropriate when using Metro-style apps. But in a nod to Microsoft's past, traditional PC software applications for Windows will still be available from third parties in the same way they are available today for Windows 7. Microsoft's new app store will be similar to Apple's Mac App Store launched in January and available for OS X 10.6 Snow Leopard and 10.7 Lion. Although Apple still allows users to download Mac apps from outside sources. Here's what you need to know about Microsoft's Metro-style walled garden inside Windows 8. Microsoft plans to ship the first version of the Windows Store with the public beta release of Windows 8 in late February. Microsoft had previously been cagey about when the Windows 8 beta was coming. During the beta period only free apps will be available in the Windows Store. Microsoft plans to roll out its app payment platform at a later date. Which Apps Will Be Available At Launch? Microsoft didn't offer many details about apps saying only a select number of developers have been invited to offer apps during the Windows 8 beta period. On Tuesday at a Microsoft event announcing the Windows Store, the company demoed Metro-style apps such as Evernote, eBay, Cut The Rope (a popular mobile game by ZeptoLabs), and digital books from Disney. It's a good bet that at least some of these apps will be part of the Windows Store during the Windows 8 beta. The software giant is also running a developer contest that will put eight apps from smaller app makers in the Windows Store during the beta period. The Windows Store will include free, and paid apps starting at $1.49. Will There Be Trial Versions Of Apps? Yes. Microsoft will allow app trials in its store. Developers can set trials to be time-based such as a 7-day trial period. App makers can also offer a feature-based trial that limits the app's functionality until you upgrade to the paid version. Will The Windows Store Have In-App Purchases And Subscriptions? Yes. But unlike Apple's iOS store, Microsoft will allow app makers to use their own payment platforms if they prefer. So newspapers could sell subscriptions using their own payment systems without going through Microsoft. How Will The Windows Store Be Organized? 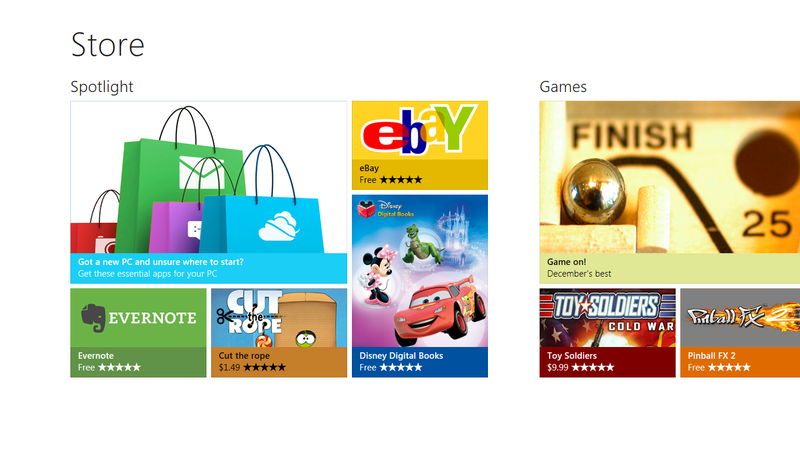 Microsoft says the Windows Store is "designed for discovery." In other words, the company claims it will be easy to find the apps you want in its app store. But the Windows Store doesn't appear to be organized all that differently from other app stores. 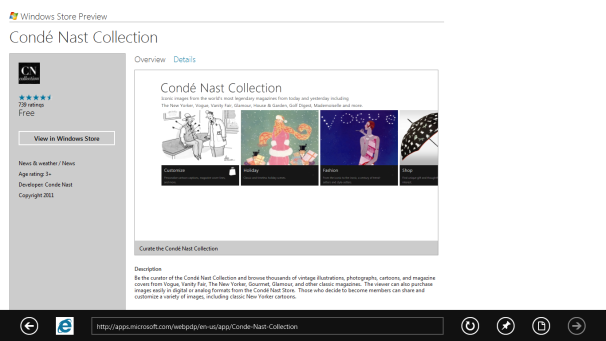 The Windows Store will let you browse apps by category, ranked lists, editorial curation and search. Windows Store app lists will include latest apps, most popular apps, and fast rising. You will also see personalized recommendations for apps based on your download history. 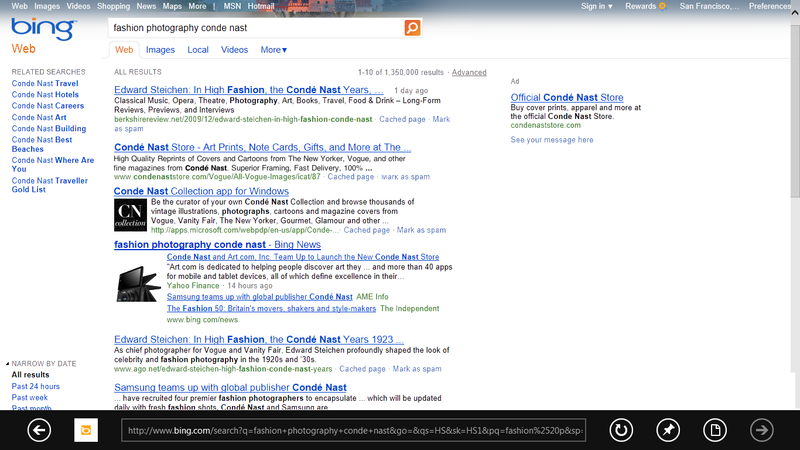 Is The Windows Store Web Based? No, the Windows Store is a Metro-style app inside Windows 8; however, Microsoft will offer a web-based catalog of Windows Store apps for web browsing. Currently dubbed Windows Store Preview, the web version will be indexed by search engines, and display a complete catalog of apps. Clicking on a link from search results will bring you to the online app catalog. If you are running Windows 8, you will then see a button prompting you to open the Windows Store app to install the program. App developers can also add a line of code to their sites that will create a "Get the app" button inside Internet Explorer 10 that links directly to the Windows Store. It's not clear if other browser will be able to display these links. Apple offers similar links that open the iTunes application in Windows or Mac, but these links work in almost all major browsers. Microsoft's Windows Store sounds promising for the software giant and is likely to convince many developers to create Metro-style apps for Windows 8. Not only is Windows the largest consumer software platform in the world, but Microsoft also plans to offer developers an 80 percent cut of app revenue after their app makes $25,000. Most app stores including Apple's App Store and Google's Android Market offer developers a 70 percent cut of app sales.